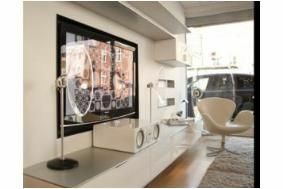 Ferguson Hill's new range includes a speaker system for your TV | What Hi-Fi? The FH009 is aimed at people wanting to improve their TV's sound with a '2.2' speaker system comprising left and right speakers and a central unit with two sub drivers and your audio inputs. The speakers come with adjustable stands allowing you to position the speakers at desktop (pictured) or floorstand height. There are also brackets for wall-mounting the speakers, set to cost a little extra. Inside the main unit you'll find a class A-B amplifier, the likes of which Ferguson Hill claims you won't find on any other system at this price-point, and has a standard RCA stereo input. Available to buy now, the FH009 is yours for £795. Joining this smaller system is the FH010, itself a compact version of the FH001 high-end speaker system. It features four speakers, with two subs and two floorstanding speakers (pictured, far right). The horn speakers sit on dedicated stainless steel stands above the subs which sit at their feet. Set for release in 'Q4' this year, it will be priced at around £6k.